I have the same 2.0 engine in a 2006. It had 19k when I bought it and has 208k now - no major repairs during that time. Fuel consumption has stayed pretty constant, and I'm not burning any oil. I never replaced the shims in the VVT, so the valvetrain is getting noisy especially at startup. In retrospect, I'd probably pay to have that job done around 100-125k. At this point, I'm just going to let it slide due to other issues (improper body work after a minor accident). From what I've seen on the forums, my experience is pretty representative of other 2.0 owners. As a long-term ownership proposition, the 2.0 seems better than the 2.3. I would echo what Daniel says. My daughter has an early 2008 sedan with the 2.0L engine and 5 speed manual that was my commuter car originally. The car currently has about 103K on it and the engine has given her no problems. I change the oil religiously on it every 5K miles and use semi-synthetic oil (although that probably doesn't make much difference when you're changing every 5K). The engine keeps purring along and has shown no issues so far (including no valve train noise so far). In general, the 2.0L engine has been a very good model for Mazda and was one reason I bought the Mazda3i Sport model in the first place when I was looking for a basic commuter. The other factor was fuel economy. The 2.0L seems to get at least 5 MPG more than the 2.3L for very little power reduction. In actual practice, I was getting between 36 and 41 MPG in highway-only driving (and keeping it under 75 MPH) for the first 40K miles or so while I drove the car. My daughter is a little more aggressive with the shifting but she still gets mid-30s MPG on the highway. Bottom line: at 76K, your car is barely broken in and I think that most car experts would tell you that you're in the middle of the car's useful life. This is the period when a car "pays you back" (sort of) and just runs with only normal maintenance if it's a good model to start with (which the Mazda3 is) and has been properly maintained. So, I would keep driving it till it needs something major, but then I'm inherently frugal (my wife says cheap). After nine+ years and 101,000 miles I must say the 2.0L is an exemplary engine, right up there with Honda's 1.8L. 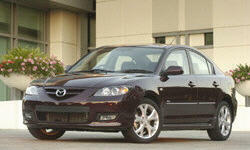 My smile remains as wide as the Mazda's grille opening.